HIGHLY PRACTICAL, NO COMPROMISE ON STYLE: THE PIONEER CENTRE SECONDS AUTOMATIC FROM H. MOSER & CIE. The Swiss Alp Watch on the Rocks is a bold statement, evoking images of ice cubes cracking between the teeth. In the manner of a high-calibre jeweller, H. Moser & Cie. has taken a creative approach for this timeless piece, the most exquisite Swiss Alp Watch to date. 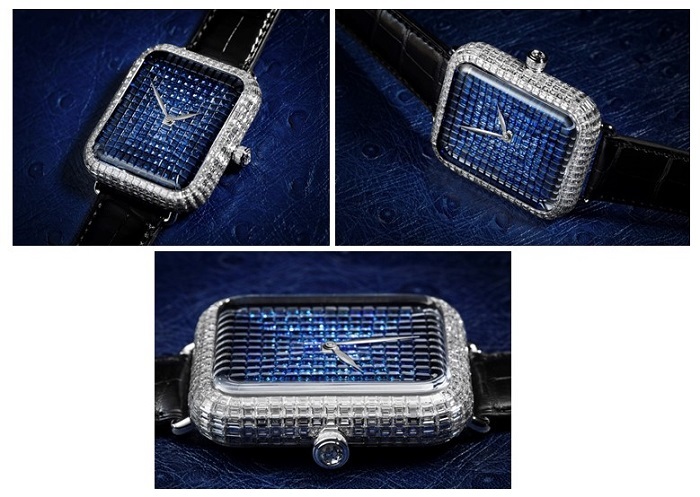 The dial is set with 232 baguette-cut sapphires, like a screen where every pixel is a sapphire and the sophisticated, ergonomic rectangular case with elegant, rounded corners is set with baguette-cut diamonds. This resolutely disconnected watch, featuring a monochrome interface in a thousand shades of blue, is a promise of time regained: time for yourself, for friends and family, with no filter and no time-consuming tools on your wrist. All with a power reserve of a minimum of 4 days, and fully rechargeable by hand.